1. If you love history, Halifax is the place to be, laying only 700 miles from where the Titanic sank 100 years ago, and being the closest land to the disaster, it was the people of Halifax that were instrumental in the rescue and recovery efforts. On the Titanic Tour, you are taken to see The Maritime Museum of the Atlantic, which boasts an extensive display of artifacts from the ship, Cable Wharf where the recovery cable ships were docked, churches where funerals were conducted, cemeteries where some of Titanic’s victims are buried, and the interpretation center and other places of interest. This tour allows you to hear the stories of the survivors; the stories of those less fortunate who did not survive and places that have historical significance from that dark day in April, 1912. 2. Coming to Halifax on New England and Canada cruises allows you to dock near the famous Pier 21. A tour of this area shows you how immigration worked years ago, as this was where new immigrants to Canada were processed. There is a museum re-enactment of this interesting pier as well as a Maritime Museum all on an easy to follow boardwalk along the coastline. 3. 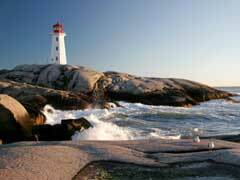 Halifax shore excursions wouldn’t be complete without a guided tour of the city and surroundings. Blue Diamond Tours offers an excursion that starts in Halifax, where you tour the Public Gardens, the Halifax Citadel, the Halifax Harbour, the Naval Dockyard (site of the 1917 explosion), Bedford Basin and the Titanic cemetery. You also drive to beautiful Peggy’s Cove, Chester, Mahone Bay and Lunenburg, the fishing capital of the world and home to the Bluenose and Bluenose II schooners. 4. Cruises to Canada offer the cruiser a chance to take a bike tour of the Salt Marsh Trail, by bicycle. Eastwind Cycle offers several bike tours, reasonably priced, and easy to navigate. The Salt Marsh Trail is an old rail bed with salt water marshes on either side, home to over 90 species of birds, interpretive sites and a leisurely route that includes Lawrencetown Beach, a surfing mecca and Fisherman’s Cove, a real working fishing village, to truly give you a taste of all that makes Halifax shine. 5. For the traveller who can’t get enough of the water, the Halifax shore excursion from East Coast Outfitters will surely fit the bill. Choose from a kayak, a stand up paddle board or a canoe and take to the water for a fun-filled afternoon. Rentals are available. Whether you arrive in Halifax on a cruise or take a ferry to Nova Scotia, these excursions are something that you won’t soon forget. Halifax boasts something for everyone, from the laid back to the adventurous and everything in-between. Come and explore the eastern Canadian provinces on a Canada cruise deal today, and be sure to take some of the many Halifax shore excursions that are offered in this incredible port.